To tour or not to tour? That was the question on my recent trip to St. Lucia with my mother. I was partial to renting a car and roaming, she was attracted to the idea of a guided tour. In the end, Mama knows best, so we booked a day trip to Soufrière with Cosol Tours. I have to admit that it made for a great day. We saw and did a lot, including some things we may not have been able to on our own. But, as with everything else, there are positives and negatives to this type of site-seeing. 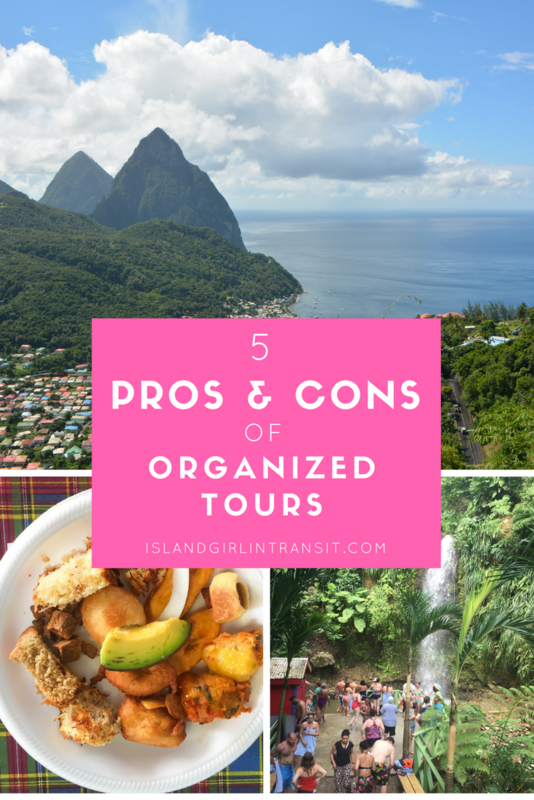 Here are my 5 pros and cons to organized tours. 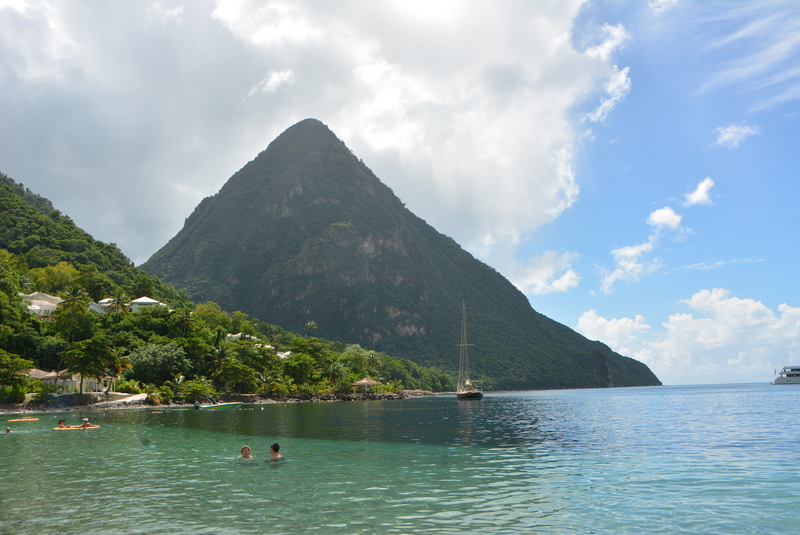 A view of one of the Pitons from Anse de Piton. Say what you want about the beaten path but I personally believe it’s as important to experience the popular tourist attractions as it is to discover things along the road less travelled. Why make it all the way to India and miss the Taj Mahal, or visit NYC and skip Central Park? Tour operators take great care to plan itineraries that take you to the key sites and attractions every visitor should witness. Things you may overlook or be unable to access easily on your own. On the other hand…knowing every single thing you’re going to see and do takes away the element of surprise so many of us crave in our travels. See something that piqued your interest along the way? If it’s not on the itinerary you can forget about it. Tour operators have relationships with specific vendors and their obligations to deliver you to their partners means that they won’t bend and sway to your whims and fancies, so be prepared to stick to the plan. 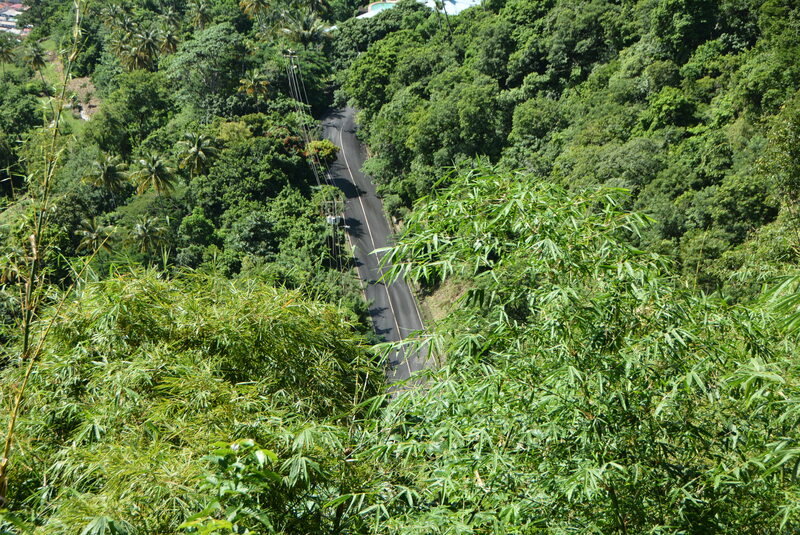 A view of long, winding, mountain road to Soufrière. Stuck in the middle of nowhere. Not sure what’s up from down or where the heck you’re supposed to turn next…depending on where in the world you’re at this might not be the most comfortable scenario. Whether the concern is one of time or security, getting lost isn’t always ideal. Taking a guide tour by professionals who know the terrain guards against that. Whats a real adventure without a few wrong turns? 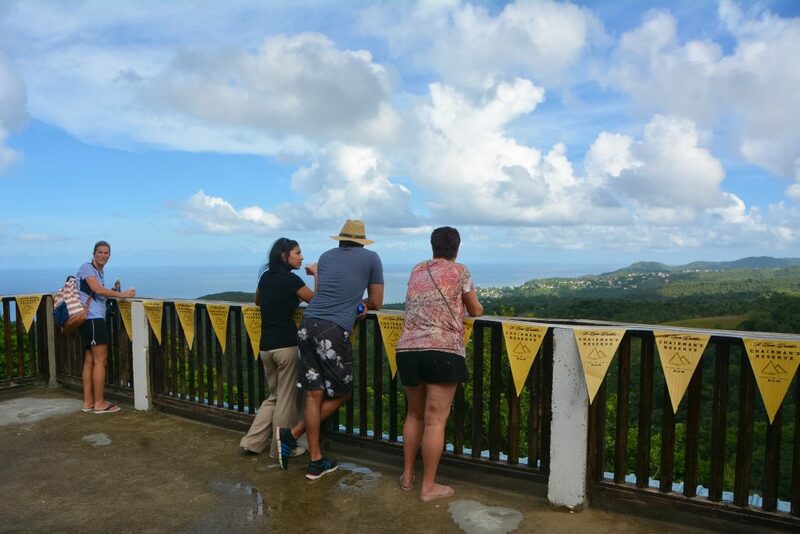 If I hadn’t lost my way during my first solo jaunt in Grenada, I never would have stumbled upon the Grenada National Museum which was full of so many historic facts and artifacts. To top it off, after leaving the museum I never would have discovered the cutest chocolate shop and bakery in St. George’s and devoured the most delicious cupcake I’ve ever tasted. 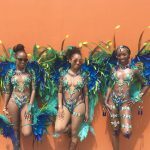 Tours are efficient but their ability to always keep you on the right track really limit your exposure to less popular but equally enjoyable and enlightening experiences the country you’re visiting has to offer. Fellow travelers take in the view from Horizon Cocktails on the way to Soufrière. People really make travel more interesting. Whether you connect with welcoming locals or bond with fellow wanderlusters, it’s always great to meet strangers who are interested, at least on some level, in the same destination as you. Whatever your motivations, you all ended up in the same place, on the same tour, experiencing the same things. Maybe the connection goes no deeper than a few exchanged smiles and an offer to take a photo or two, or maybe you spend the entire tour chatting and you leave with a brand new friend-quaintence-ship. Whatever the depth of the relationship, it’s always nice to meet new people. The know it all. The done it all. The obnoxious drunk. The selfie taker. The best-shot hog…and so many more. You encounter all types when you travel but you’re forced into tight quarters with them when you take a tour. It could be for one day or several, sometimes the personalities we have to contend with, within the confines of a small, moving vehicle for hours at a time, can be too much. Having your own transportation and being surrounded only by the people you chose to travel with, is definitely a big perk to going it alone (in my opinion). 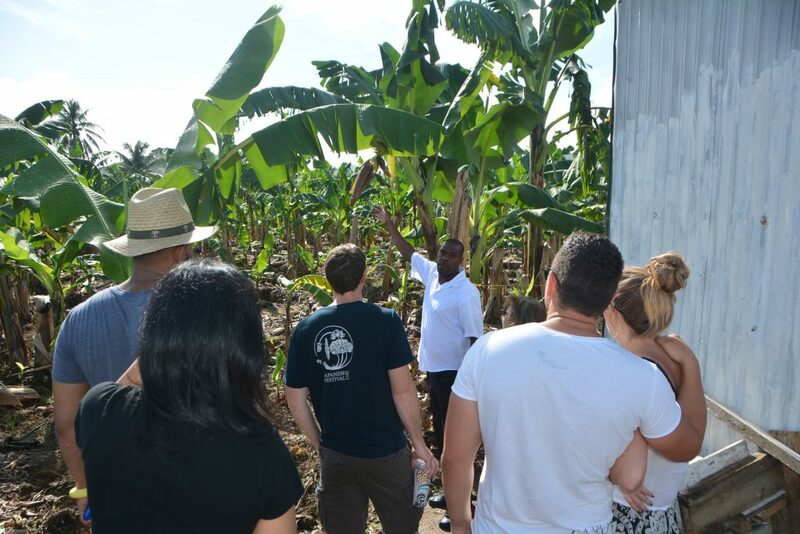 Our tour guide explains the process of growing and harvesting bananas on St. Lucia’s largest plantation. Tour guides are always full of knowledge: important names, dates and places that enhance your understanding of the sites you’re taking in. The general information they provide is usually available online but unlike tourism websites, travel blogs and Wikipedia, you’re able to ask follow up questions and, more often than not, they have an accurate and detailed response for you. On your own, you’re lucky to find a local to question, and then you’re not certain if their responses are reliable. Tour guides are knowledgeable but it’s a rehearsed knowledge meant to paint the best possible picture. You can’t fault them for wanting to put their country’s best foot forward but it results in a very skewed opinion of the destination you’re visiting. While in Cuba for example, we enjoyed a great tour to Vinales, but our truest sense of the nation’s citizens came from conversations with the taxi drivers that shuttled us to and from our B&B to Old Havana. Similarly, I gauged more about the state of tourism in Grenada from daily conversations with the guy renting beach chairs at Grand Anse than I ever could have from a tour guide. 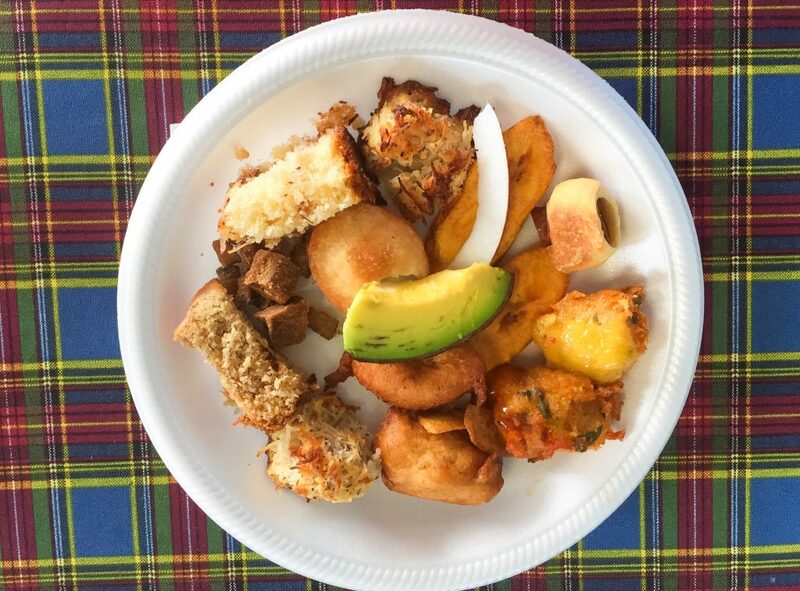 We were able to sample a delicious assortment of local treats for breakfast. Yum! Car rental, gas, entry fees, meals, drinks, snacks…things start to add up, not just in relation to cost but the energy expended to coordinate an independent excursion. A tour eliminates any level of responsibility beyond paying the tour operator. They do all the heavy lifting, allowing you to sit back, relax and get the biggest bang for your buck as they often receive favorable group rates and sometimes afford customers perks like skipping long queues. The most entertaining travel stories – at least for me – have arisen from unscripted situations I couldn’t predict even if I had a crystal ball. Yes, we could have taken a tour to Tulum while we were in Playa Del Carmen, instead we opted to catch a bus on our own and were immediately descended upon by friendly guys offering us the opportunity to see Tulum “the way the Mayans saw it” – from the ocean. It was a “short walk” from the pyramids and we could lounge on a beautiful beach all afternoon. Aces! Well, the short walk turned into a seemingly never ending 30 minute trek along a practically deserted road in the hottest sun ever and the ocean tour was entertainingly underwhelming. But we laughed the entire way and discovered the refreshing powers of Dos Equis beer as well as the most DELICIOUS quesadillas I have eaten to date. In the end analysis I’m still a fan of going it alone, but sometimes tours are a great resource if time isn’t on your side or if you’re traveling with someone who prefers to play it just a little bit safe. 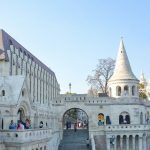 The best compromise may be to schedule a combination of tours, as well as a few days of unrestrained exploration. So…which are you? The tour-guided or the maverick? This is a great comparison of what makes organized travel enjoyable – but also what you miss out on in the process. 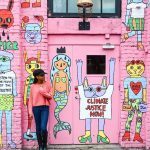 I’m personally an “indie” traveler, but I’ve done some organized tours from time to time and always enjoy not having to worry about anything. Spot on! I really love your article. I’v been thinking about organized tours a lot. And these are exactly the things I’ve been thinking about haha. I will definitely try it at least once. Just to ee for myself how I will experience it. 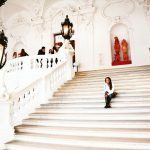 I’m totally on the same page with your thoughts on organized tours! I’m generally more of an explore-everything-myself type of person, but sometimes a tour can safe you a lot of hassle! Absolutely! Time and place for everything! Great post and it really highlights the pros and cons. I personally dont use organized tours that much. I used it once in Australia travelling from South to North which was good because It is such a long distance and I would have missed out so much if I organized it myself. I’m definitely not a tour person, but every once in awhile, I come across a good one. Iceland was my best tour guide experience. Iceland may be on my schedule for 2017 so that’s good to know! I agree with you 100% on the insights, tour guides have such a wealth of information that you can rarely access anywhere else – whether it’s online or through the average resident. So glad you enjoyed the post! Great post! We’ve been on a few guided tours, but we prefer exploring the destination on our own Mainly because we can decide how much time we spend at each spot. And I do love stumbling upon hidden gems! 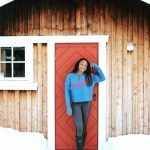 I think the hidden gems are my favorite part of travel! Making a wrong turn, or even the right turn that also leads you to something unexpected…I love the surprises! Great analysis of both sides! I like to do a mix of tours and on your own adventures. It’s good to mix it up! Love this. Even in our own country we will often jump on a tour just to see what they are telling our visitors. We love going to tourist spots so we know what people are talking about when we meet people from over the world. I find day tours or half day tours really useful as they can give you an oversight of where you are. You can then spend the next few days exploring in more detail some of the places they glanced over. And of course as you say in some countries it is very dangerous to be unaccompanied by a tour or a local. I love your blog. I’ve been on an organized tour, there are times when you just want to go your own way and explore on your own. You have a lot of interesting content. I’m glad I signed up!